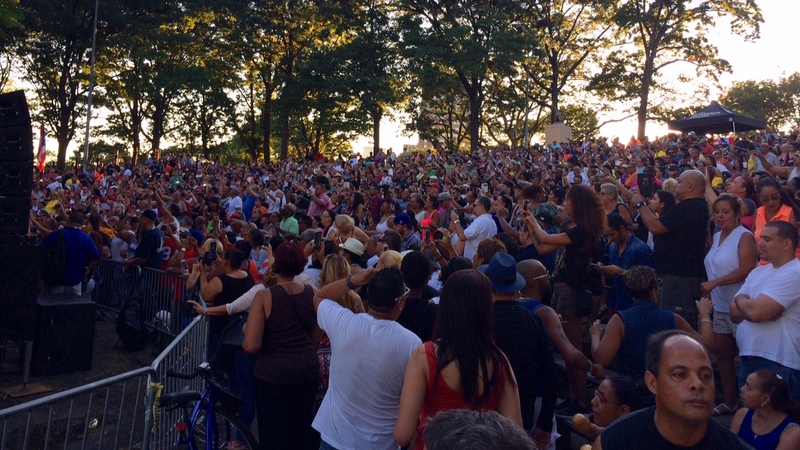 On an evening dedicated to the memory of Eric Garner, the Staten Island African-American dad killed while in police custody (members of his family were in attendance) in 2014 there were a handful of performers and activists on stage before the headlining artist went on stage – including a young woman who did a spoken word piece on police violence and the consequences it has on the different communities around the nation and a statement by New York City Councilwoman Debbie Rose. Shortly after that Terence Blanchard came on stage backed by a quartet (bass, keys, drums, guitar) starting with the complex title piece from his album “Breathless” – entirely recorded in tribute to Garner – that included a four-part harmony on his synth trumpet. The piece was very contemporary and pretty much centered on his instrument – he had little connection with the audience and didn’t seem interested on their feedback – something he seemed to be focused on doing for the entire evening. The pieces went from contemporary jazz to jazz-rock but with no New Orleans connection – something I had hoped to hear that night considering the bandleader’s roots. The band was incredibly well-rehearsed and tight but seemed unable to connect except for one moment when the guitarist really rocked out and had the audience applauding. Blanchard used a lot of effects on his trumpet and sometimes drowned out the band entirely as he experimented with the various extraneous sounds he was able to create with his horn. This was an evening of hard jazz – probably a bit off for a park on Staten Island, but I guess audiences need to be taken out of their comfort zones at times. I did not expect to hear this kind of music there, but I did enjoy it at times. It was not a bad show overall, but it was not what I was expecting to hear. He barely communicated with the crowd, and when he did he seemed a bit uncomfortable doing so. A show clearly aimed at jazz purists or those interested in really out there material – suitable for a club or a jazz festival. Another reviewer focused on the social part of the evening, but I’d rather look at the music on its own. Trio da Paz – the legendary Brazilian jazz trio formed by Duduka Da Fonseca, Nilson Matta and Romero Lubambo – celebrated the release of their 30th Anniversary CD with a residence at New York’s Birdland Jazz Club with special guests Joyce Moreno and Dory Caymmi – the first time all five artists collaborated on a live setting. The trio started out with “Saudade da Bahia,” a tune by the late Dorival Caymmi with an arrangement built around Lubambo’s lead guitar and improvisations. It was a clear demonstration of their great chemistry, as they responded to the guitarist’s accents with barely a look at each other. Moreno joined them and paid homage to what she called “their predecessors” with a very personal rendition of “Chega de Saudade”, beginning accompanied by her own guitar and joined by the band after a few measures. She included a few snippets of “Aquarela do Brasil” to the tune as Lubambo riffed around the melody. She followed by her own “Essa Mulher,” a tune Lubambo mentioned he’d personally selected for the set, including an accomplished bass solo by Matta. Dori Caymmi joined the group and sang his “Joazinho Boa Pinta” a humorous tune about a good-looking rascal of sorts. The trio left the stage as Caymmi and Moreno played a beautiful duet on Jobim’s “Dindi” with Caymmi on guitar. They followed that with Caetano Veloso’s “Sampa,” a song written as a tribute of Brazil’s largest city. I like to say that Trio da Paz are “the Rolling Stones” of Brazilian jazz because they have great individual moments as bandleaders in their own right, but there is clearly some magic when they perform and record together. This perception is renewed every time I hear them live – in spite of all these years, they are symbiotic and work together in a manner rarely seen with ensembles where the focus is on individuality. This was clear at Birdland, when they took on originals tunes and classics like “Voce Foe a Bahia,” a playful melody on the uniqueness of Caymmi’s native state. It was a great experience to hear Trio da Paz with their guests – I just wish the set I heard had included Da Fonseca’s “Flying Over Rio” – but I am sure there will be other chances for that soon enough. On the closing concert of their tour in support of Next Spring (Homerecords.be, 2015), the Mehmet Polat Trio (Polat: oud; Sinan Arat: ney; Bao Sissoko : kora) took to the stage of New York City’s Drom for a selection of original songs. Polat briefly introduced the trio telling the audience what the music was about and immediately set out into their set, opening with a mellow-sounding number based around a simple chord sequence, with all the members freely improvising around the melody. Without interruption, they went right into the second number, a syncopated tune mostly based around Sissoko’s instrument. The trio kept at this pace, going from seamlessly from song to song without pausing – the end of each tune prompted the next, but the differences were quite noticeable as the rhythm and melodic groove constantly changed. The chemistry that Polat, Arat and Sissoko have is very evident – just a glance at each other is enough to communicate where the music might be going, and during improvised moments they just find themselves in great synchronicity, finishing off a solo where one of them left off. During a short break between songs, Polat talked about their instruments’ origins and their sonic particularities, and then went on to play two final tunes, beginning with a composition by Sissoko that had a strong West African feel with some traditional Turkish tones in between. The groove seemed to go around a single chord with lots of improvised moments. They closed the set with a tune that was based around the kora and that picked up speed every few bars, which kept audience members wondering when it was actually going to end – a simple melody that stayed in my head for at least a few hours. The Mehmet Polat Trio rarely performs stateside, but they should be returning in the summer – it would be great to hear them again, since we don’t have many opportunities to hear a group to dares to take traditional music to the next level – one that so greatly integrates two cultures in such an amazing manner. Guitarist Romero Lubambo, drummer Duduka Da Fonseca and bassist Nilson Matta are all accomplished bandleaders in their own right, but when they get together as Trio da Paz there is clearly some extra musical magic going on. The three musicians have fantastic chemistry together, and that can be heard not only on a live format but also in the studio. The group began via informal rehearsals the three musicians did together before officially creating Trio da Paz, which now celebrates its 30th anniversary with 30 (Zoho), a record containing mostly original material written individually by Lubambo, Da Fonseca and Matta. The album kicks off with “Sampa 67,” a Matta composition that honors the city of the bassist’s birth (not to be confused by the similarly titled Caetano Veloso tune). The track is centered on the bass and drums with guitar riffs. They revisit Lubambo’s “For Donato,” a tune played around a bassline that is reminiscent of Dorival Caymmi’s “Samba da Minha Terra” but then goes into a completely different direction. The song was previously recorded by its composer on 2002’s Rio de Janeiro Underground, but here the arrangement is markedly faster than the original recording, focusing on all three band members. Also revisited is Da Fonseca’s “Flying Over Rio,” a song previously featured on the drummer’s quintet album “Samba Jazz” (Anzic, 2013). The Trio da Paz version is more stripped down, focusing on Lubambo’s nuanced guitar playing. As someone who has seen this trio perform live many times in the past decade, I cannot wait to hear how they will treat these tunes on stage. I have been in awe of their music ever since I heard them for the first time at the Jazz Standard in 2005, and I hope they stick around for a very long time. Ernest Barteldes’ Annual Christmas Music Wrap-Up is Back! For quite a few years I ran an annual wrap-up of the new Christmas music on NewCity over in Chicago, but attentive readers might have noticed that it didn’t happen back in 2014. I got a number of emails about it not only from publicists but also from music fans who looked forward to my annual list of must-haves and albums to ignore. As I have stated before, the new editor who took over the music site (their publisher used to run it himself, but he seems to have wanted to delegate power to other people) pretty much turned his back on long-time contributors so a review I had already written ended up unpublished. After confronting both the publisher and the new editor over the article I pretty much gave up on dealing with so-called “visionary” individuals and decided to start – for better or worse – this music blog. Jazz pianist David Benoit is one of the most talented contemporary pianists of his generation, and his third Holiday-themed album “Believe” (Concord Music) is one of the best I have heard in a long time. Sticking strictly to a straight-ahead format, he goes through a number of standards, masterfully bringing together the Charlie Brown TV specials with “Guaraldi Medley,” a beautiful tribute to the pianist who helped introduce a generation of kids to jazz. Vocalist Jane Monheit joins the trio rounded out by drummer Jamey Tate and bass player David Hughes to create the kind of album that is not your usual classic radio stuff, but something you could hear anytime. Thirty years after its bandleader’s passing, The Count Basie Orchestra has continued to make music without any sign of slowing down. Currently under the direction of trumpetist William “Scotty” Barnhart, they have recently collaborated with the likes of Tony Bennett and Ledisi, the latter of whom is a featured performer in “A Very Swingin’ Basie Christmas (Concord), a fabulous piece of music that is sure to be spinning when Renata and I spend our annual Christmas retreat at home away from everyone else that annoys us. One of the best tracks is “The Christmas Song” fronted by the fabulous Ledisi, who keeps her New Orleans roots on a very traditional arrangement. Things also stay in the Big Easy with “I’ll Be Home For Christmas” led by pianist extraordinaire Ellis Marsalis, the legend who happens to have fathered some of the greatest jazz bandleaders of their generation say what you will about their individual personalities, but you must admit their talents are unquestionable and undeniable. I am not one to say much about someone trying to introduce a new Holiday song to the canon, but Rebecca Angel and the band led by her bandleader father Dennis Angel actually pull it off with their single “My Favorite Time of the Year,” a groovy, bossa-inspired tune with a sincere vocal that might just make it into the canon, specially thanks to the smart arrangement and an honest vocal delivery. One of the most anticipated Holiday albums to me is Broadway Cares’ “Carols for a Cure,” when the casts of several shows in town come together to come up with a mix of classic songs, original and parodies. Unlike recent releases, there are no obvious celebrity voices, which makes for a better n overall an enjoyable experience – except for the presence of Perez Hilton on “Happy All The Time” with the cast of “Elf” – I mean, what is a goddamn blogger doing on a Broadway album? Makes no sense to me, but since he is being featured for the third time in a row I must be missing something. Among best tracks this time around are “We Three Things” with “At This Performance,” which takes the classic tune to a whole new jazz-tinged direction. The best original is Chicago’s “Christmas in Fishnets,” which chronicles the routine of performers at the Great White Way during these festive days. Also notable is the mostly acoustic “Mary did You Know,” a poignant folksy tune that asks Jesus’ mom about her expectations on the baby she held in her arms on that first Christmas. These are all great albums – just check them out, all of them will make for a joyous season. I’ve been following Badi Assad for about fifteen years, from the time she was doing more avant-garde instrumental-oriented music right into her shift into the pop-jazz-fusion material she started putting on her records, going from 2005’s Verde up to Hatched (QuatroVentos), in which she reinvents pop hits in her own way – the tunes are still recognizable, but her personal imprint combined with her signature acoustic guitar chops – are undeniable. My favorite recreation was her take on Lorde’s “Royals” – Assad plays it double tempo, with Simone Sou’s strong percussion as a backdrop to the Assad’s fluid guitar and Rui Barossi’s upright bass. I am looking forward to catching this material in a live format. The last time I saw her perform was during the Verde tour, when she played accompanied solely by her guitar – it was great, but I would love to see her stretching it live with a band behind her. Not that she needs it at all – she is highly engaging on her own. If you happen to live anywhere near where she’s touring, do not miss the opportunity to hear her live. I have already told my friends in Fortaleza – the only major Brazilian city she is playing in at the time of this writing – to go to the show. And a note to my readers in Chicago – the publication there that I have contributed there for over a decade has a new music editor who thinks he is the last Coca-Cola in the desert. He is doing the usual house cleaning that commonly comes with change in the masthead, so you will not be seeing my byline there for a while. The solution? Subscribe to my feed, because I have not forgotten you. 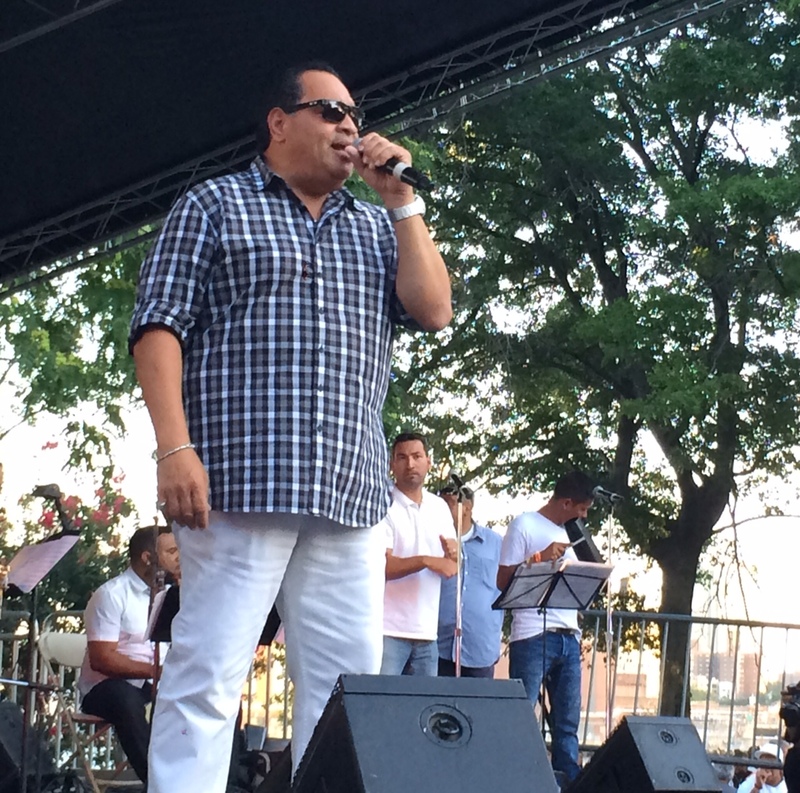 Playing before a filled to capacity East River Park Amphitheater, salsa legend Tito Nieves took to the stage backed by a 10-piece band and kicked the set with a high energy number that had those standing next to the stage pairing up to dance. He paused briefly to thank the audience for being there and saying he was happy to be ‘back home’ to the Lower East Side. He then followed with the English-language “I’ll Always Love You” (not to be confused with the Dolly Parton hit of the same name). He also coached the audience to scream at the top of their lungs (“for New York”) during an up-tempo number that celebrated being part of this city’s community. Nieves then stepped back to the backing microphones as he brought his three backing vocalists to the spotlight as each sang lead in one number – something you don’t usually see with major stars. One of the tunes name-called several Latin American countries and got a screaming ovation when Puerto Rico was mentioned. When Nieves returned to the lead microphone, he briefly spoke of the various Latin clubs he performed in New York, and tricked the audience when he mentioned a place that was not a club but a popular hotel. 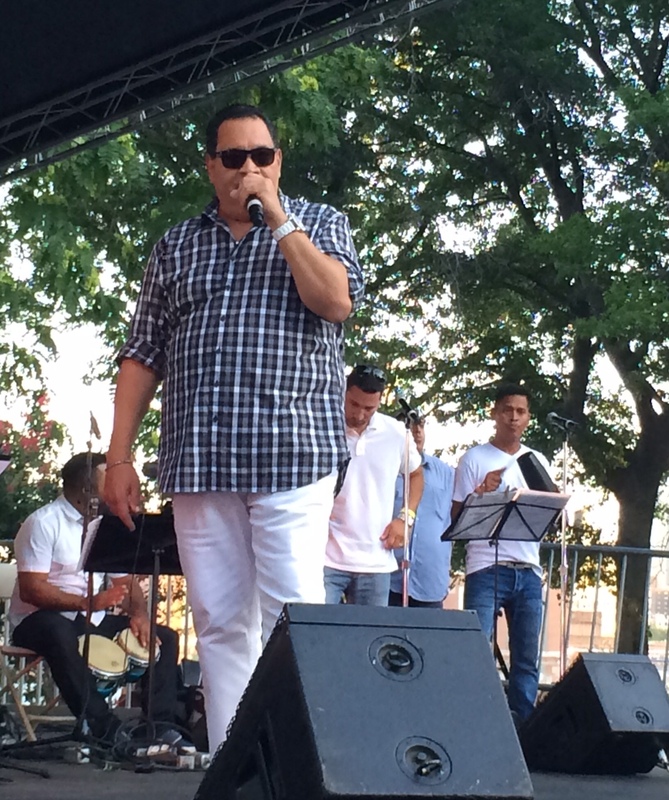 Nieves is regarded as “The Pavarotti of salsa”, and deservedly gets that nickname. He has great energy and a potent voice – he has great communication with his fans, and sings each number with great feeling. That is especially true with tunes that have something deeper to say – an example of this is “Fabricando Fantasias,” a mid-tempo ballad about a bitter breakup and a man’s refusal to accept the end of a love affair. Towards the end of the set, the pace picked up and became almost relentless – Nieves had a burst of energy at this point – songs just came one after the other with no pause. At the encore he did a very up-tempo song in which he jumped and stopped the band for several fake endings that made the audience scream. I was half hoping that Nieves would include a couple of songs from Unity (Universal Music), the Michael Jackson salsa tribute album he participated in earlier this year. That didn’t happen, but the choices were clearly crowd-pleasers for his core fans. It was a lovely evening of Latin Music in just the right atmosphere.